Although dental crowns can be made of a variety of materials, including stainless steel, gold and silver, nothing is healthier and looks better than a porcelain dental crown. 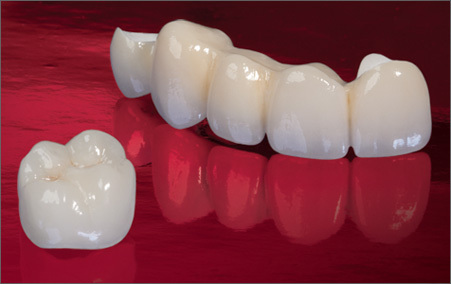 Porcelain dental crowns match the natural color of your teeth and are virtually undetectable by the naked eye. And because they’re metal-free, porcelain dental crowns are an excellent option for patients with metal allergies. Best of all, porcelain crowns don’t just look beautiful – they’re long-lasting, and gum friendly too! BruxZir solid zirconia is made out of biocompatible zirconia powder. BruxZir dental zirconia crown are considered High-strength crown option for grinders who have destroyed natural teeth or previous restorations. Consult with your family dentist Dr. Haroonian in Newport Beach about the right type of crown for you. Contact us today to schedule your consultation. Dental bridges have been used for centuries to replace missing teeth. Today, dental bridges are still considered one of the most durable, conservative and cost-effective options for bridging the gap between a missing tooth and surrounding teeth. Comprised of two anchoring teeth and a replacement tooth, dental bridges help prevent surrounding teeth from drifting out of position, improve chewing and speaking, and help keep your natural face shape in fact.